This walking tour will introduce you to Yaletown's history and describe buildings with special historical and architectural interest. Yaletown used to be a relatively-unknown warehouse district in Vancouver's Downtown South. Since the 1990s, the area has redeveloped into a vital part of the city with a mixture of art galleries, retail stores, restaurants, offices, and residential developments. 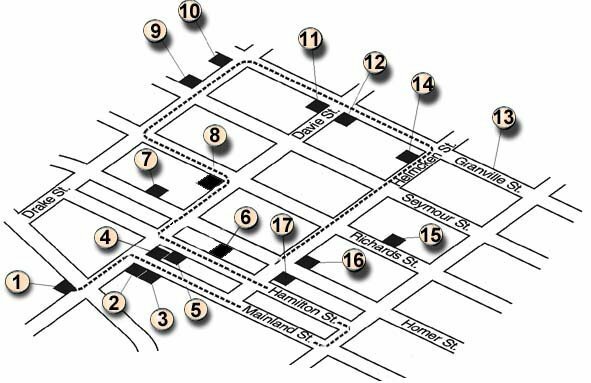 You can still see early rooming houses, late 19th-century warehouses, and some surviving single-family homes. The entire tour will take about two hours and starts n Pacific Street between Drake and Davie Streets. Walk the tour during business hours to see the interiors of commercial buildings and appreciate the interesting mixture of old and new Yaletown workers. See photos and descriptions of the buildings indicated on the map. The CPR built the red brick roundhouse at the northern edge of its repair yards in 1888. The roundhouse was used to service steam locomotives. The building has had many additions over the years. During its restoration for Expo 86, the original 1888 portions along with the 1950s diesel shop were retained. Engine 374, the first train to cross Canada to Vancouver in 1887, is also located within the Roundhouse complex. The Roundhouse has been converted to a community centre to serve the residents of Pacific Place and the north False Creek area. Built in 1993 to house an elevator to underground parking and remodelled in 2006-09 as the entrance to Yaletown-Roundhouse Station, this two-storey structure marks the entry into this triangular shaped plaza. The design of the structure, with its open timber frame, use of brick and arched window openings, pays homage to the warehouse style buildings in Yaletown. The plaza’s low curving wall denotes the original False Creek shoreline. The story of this building's changing uses may come to be a typical Yaletown tale. It was constructed in 1913 as a warehouse and office space, and its tenants included the National Bag Company and the Canadian Naval Store. Renovated and renamed, it now houses several architectural firms. The building appeals to today's professionals because of its proximity to downtown at a relatively low cost, and its sturdy, straightforward good looks. Stroll along Mainland, Hamilton, and Homer Streets and notice how the warehouses in Yaletown take advantage of their sloping sites. The fronts of buildings with office space are located uphill. Downhill are the loading bays. These working ends of the warehouses were wide enough for easy unloading of boxcars that used the railroad tracks running throughout the area until their removal in the 1980s. Today the docks serve as extensions of adjacent buildings and large elevated sidewalks with a variety of commercial activity. Most of the warehouses were built between 1909-1913 and are four to six storeys high, with internal elevators that were used for shifting goods. Permanent canopies, cantilevered off the rear of the buildings, sheltered goods and workers. The one-way streets were necessary because of the width of the rail cars. This warehouse building was completed in 1912 and is typical of the development that was occurring in Yaletown during this period. Its utilitarian design allowed for storage, manufacturing, office and commercial uses to be accommodated within the same facility. A fire in the early 1950s resulted in the window openings being filled in with poured concrete. The building was rehabilitated in 1994 with a mix of residential and commercial uses. This was built in 1913 for Front Darling & Co., Electrical Supplies and Machinery. Peek inside the café to see what can be done with careful attention to detail in the collection and installation of fixtures and furniture. Rooming houses such as this one offered inexpensive, convenient lodgings for the many single working men who crowded into Vancouver in the early 1900s. Completed in 1910, the building was designed by architect J. Pearson for David McCall, a CPR boilermaker. The double-entry stair and the wooden cornice and brackets are original, but the gingerbread curlicues were added when the building was renovated for office use. Completed in 1928, the former Canadian Linen Supply Building was designed by the notable Vancouver firm, Townley and Matheson. Its concrete construction and streamlined design are indicative of industrial Art Deco architecture. The protection and adaptive reuse of the building as a public market was achieved through the City’s unique Heritage Density Bonussing system. In exchange for ensuring the building’s protection, the property owner was allowed extra density, a portion of which could be sold off-site at a later time. Completed in 1993 by VLC Properties (established in 1989 as the Vancouver Land Corporation and now known as Greystone), this 12-storey building contains 193 dwelling units of market-rental housing. One of the first of its kind, it demonstrates the type of high-density residential form of development that is encouraged in the Downtown South, and responds to the need for affordable, rental housing. During the building’s planning stages there was considerable discussion of the proposed size of the units. Considered to be small by traditional standards, 64% of all units are less than 320 square feet. Built in 1890, this is one of Vancouver's oldest surviving buildings. The Colonial Hotel, as it was called, was a rooming house for workers at the CPR yards. Its mansard roof, arched windows and decorative brickwork are distinctive features. Drake Street between here and Pacific Boulevard was the heart of the original Yaletown settlement of CPR workers. This building was completed in 1890 as the Golden Gate Hotel and has been continuously occupied since then. The ground floor was the original location of The Bank of Nova Scotia, which opened at that location in 1912 and moved to its own building across the street in 1929. Since 1940, there has been a restaurant on the corner. Designed by architects Sharp and Thompson and completed in 1929, the former Bank of Nova Scotia employs a mix of the Art Deco and Classical Revival styles, and was one of the grander buildings along Granville Street. As you walk along the next two blocks, notice the wooden frame commercial buildings, often with living quarters on the second floor. Most of these date from the early 1900s, and are little-noticed survivors of the old Vancouver languishing on the edge of the modern commercial district. Between 1910 and 1913, many modest hotels opened along this stretch of Granville Street. With tiled entryways, brass handrails and polished marble stairs, the hotels were home for many of the travelling salesmen working the region. Five of the hotels in this block, the Barron, the Glenaird, the Regal, the Royal and the Vogue, were designed and built by notable Vancouver architects Parr and Fee. Parr and Fee designed a total of twelve apartment hotels between the 800-1200 blocks of Granville between 1908 and 1911. They were also the designers of the Vancouver Block at 736 Granville, which is a prominent landmark with its large neon clock. Built in 1907 for salesman Robert F. Emory, this building was at one time a violin studio. Percy Linden has owned the house since 1970 and in the spring and summer months his many colourful birdhouses are visible. Although increasingly rare, examples of single family homes still remain from the original Yaletown neighbourhood, one of which is the George Leslie House, located at 1386 Hornby Street. This house, completed in 1888 is the oldest surviving house in Vancouver and has been adaptively re-used as an up-scale restaurant. The Lightheart Apartments were built in 1910 for W.A. and J.R. Lightheart. Like the Homer Apartments at 337 Smithe, it had two wings separated by a central cavity. Now known as Brookland Court, it was remodelled and converted to social housing around 1990. Sebring Auto/Letter Carrier Depot #75 ("The Automotive"), the long, low lines of this building reflect the "streamline" moderne style. Efforts to design aerodynamic automobiles influenced its smooth, streamlined profile. This building and the next were designed to house the kind of light industry that city planners hoped to attract to the area with the 1929 zoning changes. Built circa 1910 for the Canadian Westinghouse Company Ltd. as a warehouse facility, this building was rehabilitated in 1992 by Novam Development to accommodate office and retail tenants. The rehabilitation involved the removal of ground floor additions and installation of new storefronts that recall the original configuration and detailing. New, smaller scaled canopies reminiscent of the large industrial canopies prevalent in years past in Yaletown were also installed. Like many parts of Vancouver, Yaletown's early days were shaped by the Canadian Pacific Railway. In 1886, Vancouver became the western terminus for the CPR, and the City of Vancouver offered the CPR a 20-year exemption from local taxes if it built its rail yards and repair facilities on False Creek's north shore. The CPR agreed, moving its machinery and employees from its former shops at Yale in the Fraser River canyon to the new site. The CPR workers felled trees, cleared a townsite, and graded streets. They built a roundhouse and other facilities for maintaining and repairing steam locomotives. For their own shelter, some workers literally moved house, loading their houses in Yale onto flatcars and sending them by rail to the new Yaletown. Most, however, lived in rooming houses like the Yaletown Hotel, which offered companionship, cheap lodgings, and board to the many bachelor railroad workers. Over the next 20 years, other heavy industries found the north shore of False Creek accommodating. By 1907, a shingle mill, cooperage, and cement works were operating by the creek. Sawmill workers floated booms in the creek and loaded lumber destined for the Canadian prairies onto nearby rail cars. Labourers in these industries usually lived nearby, thus saving streetcar fares by walking to their workplaces. On this walking tour, look for the handful of remaining wooden frame houses from this era. Imagine street after street closely packed with similar modest homes and a neighbourhood of people who walked to work and school together, socialized at church suppers, and argued at union picnics. Imagine also the thick clouds of black smoke that contemporaries recall hanging over the area day after day. At the turn of the last century, business was good throughout the province: mining in the Kootenays, farming in the Okanagan, and fishing off the coast. As people in small towns found they had cash in their pockets, they searched the local stores for ways to spend it. Vancouver cashed in, becoming the wholesaling centre for western Canada. Goods were shipped from the east on the CPR and warehoused in Vancouver. Armies of travelling salesmen fanned out over the province, supplying small-town shopkeepers. By 1910, over 1,000 commercial travellers called Vancouver home. In 1900, the City laid out a new eight-block warehouse district near the original Yaletown. Next door to the old CPR Yaletown, this new Yaletown (the one most commonly recognized today) was bounded by Nelson, Homer, Drake, and Pacific Streets. All but four of the buildings noted in this tour were built between 1909 and 1913. The original tenants were warehousing companies, truck and transfer firms, and small manufacturers. This district, located near both the CPR’s rail lines and its shipping dock, was a convenient and cheap point for processing, repackaging, and warehousing goods before they were shipped once again. In the late 1920s, when Vancouver considered its very first city plan, City officials felt certain that, to prosper, Vancouver would need more industry, and that new industry would want to locate near downtown. The area between the bridges at Cambie and Granville Streets, which included Yaletown, seemed a logical place. In 1929, the City passed a series of zoning bylaws based on this vision, and Yaletown itself was zoned for commercial and light industrial uses. City officials expected the construction of more six-storey warehouses like those built between 1909 and 1913. But that is not how its future turned out. Vancouver attracted industry, but, with the advent of truck and trailer transportation, most of that industry located itself near freeways on low-rent suburban land. And although downtown Vancouver prospered, it was a city of white-collar office workers. Some light industries, such as printers and food processors, did build in Yaletown. But the zoning had the most dramatic impact on the working-class neighbourhood. As factories and shops threatened residential streets, home-owners sold out. By the 1950s, even the nearby Central School was closed. During the 1960s, Vancouver began its transformation into a city of highrises. But Yaletown and the adjacent area remained untouched by this trend. Yaletown’s participation in the boom was limited to providing cheap parking for commuting office workers. Deteriorating houses were razed to create the many small surface parking lots that still dot the area. The City has recognized Yaletown's architectural and historical importance by zoning it as a historic district which allows for new uses while maintaining the special character of the area. Former industrial buildings and working-class houses are now occupied by professional offices for architects, lawyers, and accountants, upscale eateries, trendy nightspots, and loft-style residences. Yaletown’s redevelopment into a residential neighbourhood has in some respects parallelled its early growth when workers moved here to be close to their workplace. Only now the majority of today’s jobs are in the office and service industries, a far cry from the early industrial smoke and grime.